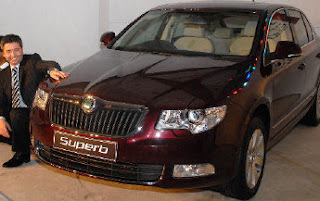 Skoda re-launched the petrol variant of its sedan Superb on Tuesday, March 10 in New Delhi. The new model is equipped with a 1.8 litre petrol engine as against the earlier model with a 2.8-litre engine. Its 2.5-litre diesel variant, which was also phased out early this year, is likely to be replaced with a 2-litre engine in the next 3-5 months. Superb is priced at Rs 18.8 lakh which will compete with Honda’s Accord. The company said that of the total market of 8,000 units in the D segment cars, it expects to sell about 1,000 units of Superb this year. Skoda has about 52 per cent market share in the premium segment which costs in the range of Rs 13-26 lakh. Last year, the company sold about 16,500 units, a 50 per cent growth over the previous year.